One way to find a startup idea is run into a problem, solve it, and turn the solution into a business. So here’s a simple problem. Over the last few months, I’ve been using an iPad for my “feet up” (i.e. on the couch) computing – reading, web browsing, a little light input for email, social, etc. Then, last week I was travelling and ended up doing the feet-up computing with a laptop instead. It was a laugh-out-loud revelation how much faster and more efficient a laptop was than the iPad. Yet, I still love the iPad for reading and certain forms of browsing. What’s the problem? Most commentary on the iPad IO challenge has centered on the keyboard (see engadget on Zaggmate, for instance). That’s understandable in its way, since the iPad is smartphone-like and the principle smart-phone IO problem is keying. Understandable, but mostly wrong. 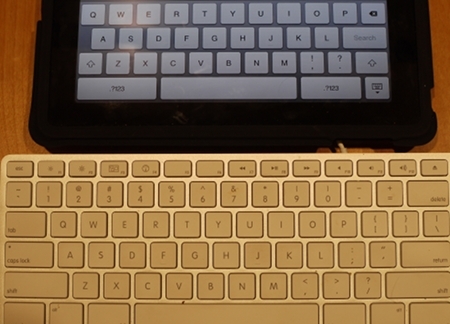 Here is an image of the landscape mode iPad keyboard up against a full-size external MAC keyboard. Look at the size of the keys, and the distance spanned between the “Q” and the “P” – that’s right, the iPad keyboard is as big as a full-size keyboard. The keyboard is not the main issue. 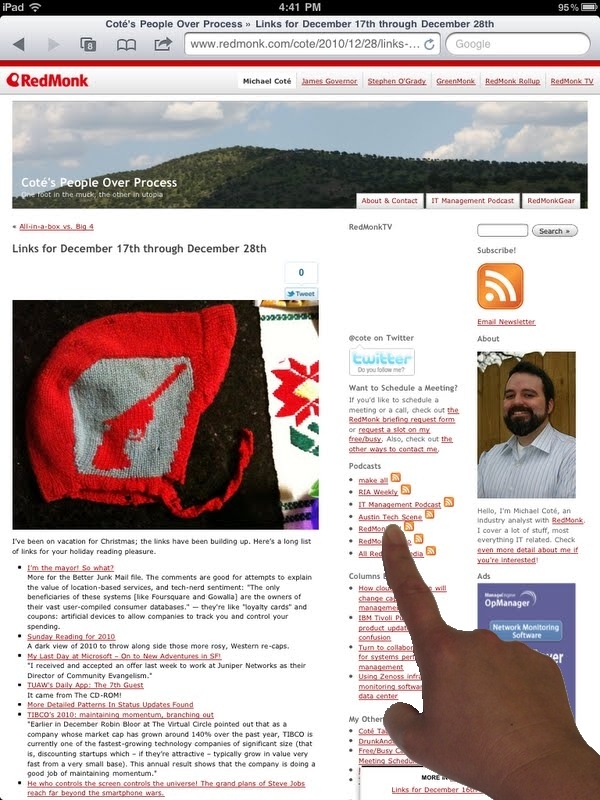 The user is trying to touch a link – but the links on this webpage are too crowded together for an accurate touch. This lack of precision on a touch gesture is the root of the difficulty of navigating and inputting on the iPad. It’s not just links. 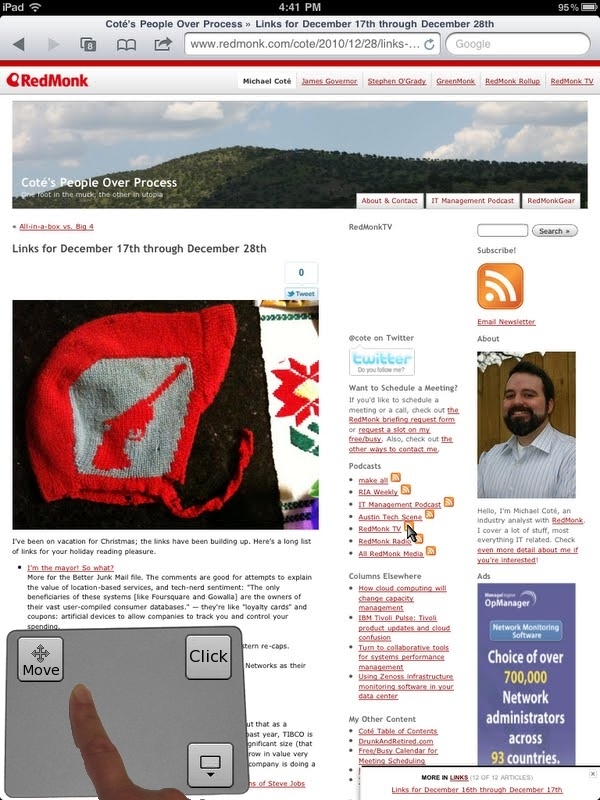 Plenty of web-apps make their buttons too small, or too crowded, for comfortable touch access. When editing text with the keyboard, and trying to position the cursor by touch, it is very difficult to touch in the right point in the text. This is the biggest reason I’m slower at entering text on the iPad. When editing graphics, it is tough to select the correct pixel for fine-grained modifications – a shame, since touch is a great way of making pictures, like painting with fingers. An artist can draw the picture, but can’t touch it up. A real shame. So – what’s the solution? Well, a bluetooth mouse would be one – but an external input seems counter-iPad, and not much of answer for feet-up computing. Here’s something better – a virtual TrackPad (click on the mockup to enlarge). Allow the user to summon it up with a twist-3-fingers-on-the-glass gesture. It provides a mouse pointer which is moved around just as on a conventional mousepad. Clicking could be via a “Click” button, or simply tapping briefly on the virtual trackpad. A “move” button is provided so that the virtual trackpad can be repositioned on the screen. The position and orientation of the trackpad would shift automatically when the orientation of the iPad changed. “Ordinary” touch would still be default most of the time, maintaining the maximally intuitive “touch it directly” sense of the iOS touch interface. In terms of business expandability, perhaps there are some apps for which fine-grained mouse control is so fundamental that a startup could build and win with those apps. However, if fine-grained pointing proved successful, Apple could replicate it. It could be protected with patents, but who enjoys patent-driven business? And for an exit, with Apple the only obvious buyer it might be hard to drive a great price. There are of the order of 10m people with an iPad at time of writing, with the number growing fast, so it is a decent volume market (not huge yet, but decent). Probably 4/10 as a startup idea. More of a feature than a company, as they say. Maybe Apple could just do it for me; or if not perhaps I’ll just have to buy one of these instead. Yet another approach would be target non-Apple tablets, especially Android. Even in Android, though, it is not possible to simply add this capability – you would either need to rebuild the key apps (as per iPad), or build your own tablet, or persuade Google and/or the device manufacturer or carrier to include your changes. The conventional wisdom of the moment is that iPad may dominate in the tablet space. It is a sad fact that existing Android tablets are messy, inferior iPad imitations. If Android is to break out, it likely needs to innovate in user experience as well as cleaning up the interface messiness. It is possible that there are a set of user interface innovations – of which a pop-up virtual trackpad might be one – that could offer a chance to leapfrog Apple. So a broader idea for a startup would be a “fork Android 3.x and do it right” company. That might have more potential, though it would not be one for the faint of heart. Update (Android 3.0 screenshots): Coincidentally, just saw preview video of Android 3.0 (Honeycomb) as posted by Google. What’s there? 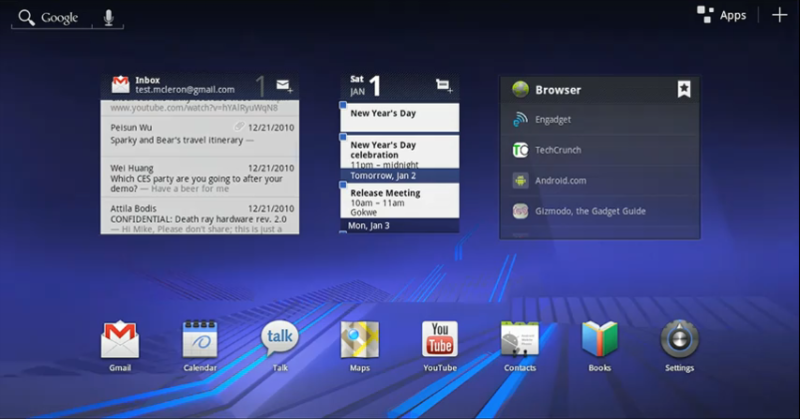 At 20 seconds (above), they show a more desktop-like tablet screen – App icons along the bottom, multiple running widgets in the upper part of the screen, like the MAC’s widgets screen. 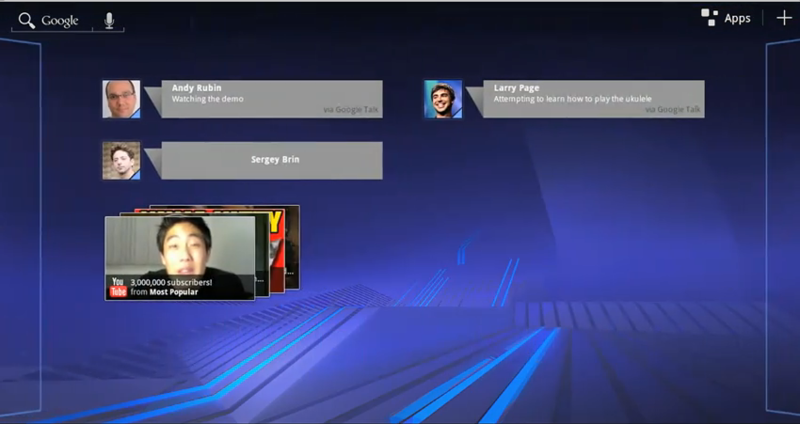 Above, you see a chat client with 3D stacking navigation. Above you see another multi-application view, with multiple widgets running and a (again MAC like!) visual navigation bar along the top. 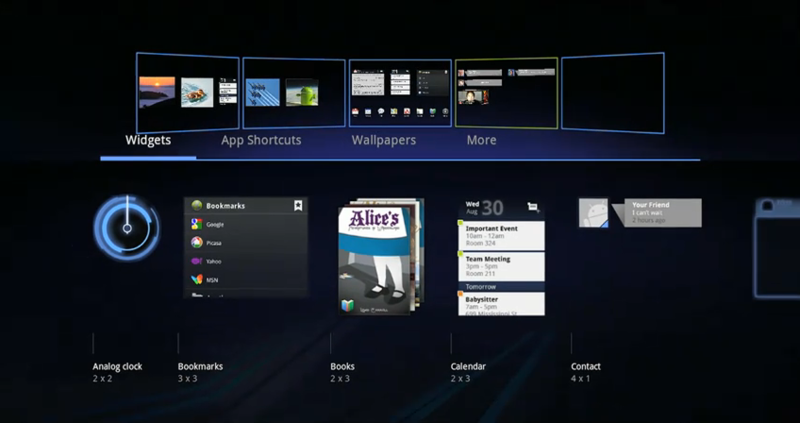 Immediately after, they show you pulling on the widgets to a particular screen and/or zooming in. The rest of the video shows them having redone various of the Google web-apps for Tablet, which is important but presumably not Android specific. Very quick take – they’re trying to solve the multi-application problem, making the tablet into more of a touchable desktop. Providing a more sophisticated UI experience is a valid problem to go after, whether they’ve succeeded without sacrificing iPad-like simplicity and intuitive user experience we shall see. I like it… It doesn’t quite eliminate the real-estate impact, since you can’t click on things under it I think (not without making it very confusing). But making it semi-transparent would at least keep that section of the screen part of the overall image. I just pinch to zoom in to point to those tiny buttons! Of course, pinch-out-then-touch is what everyone does… But this is an illustration of the user-experience bug, not a solution 🙂 You shouldn’t have to be adjusting, and readjusting the magnification to work the UI.